Tracy has an engaging way of embracing the moment. With every obstacle, Tracy looks for a positive signal and draws strength from that symbol. There is a magic about Tracy. 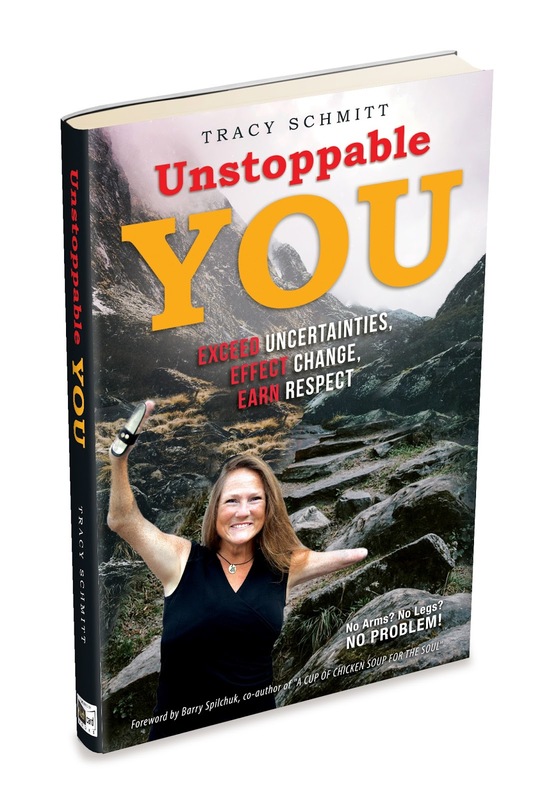 Without even trying to, Tracy educates people on how to be unstoppable. We all benefit her dream to have the world see ‘people’ first. ~ Barry Spilchuk, #1 bestselling co-author of A Cup of Chicken Soup for the Soul. Have you been underestimated, and disrespected, or have faced resistance for even trying? Do you occasionally end up not getting the results you are looking for, or held back by self-doubt? Are there roadblocks and insurmountable obstacles in every direction that you reached a point where you think you can’t do it anymore, any better, or in any other way? 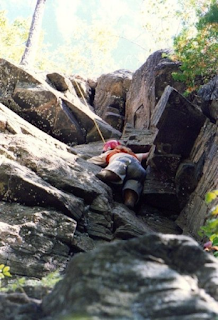 Do you fear going 'all in' plagued with uncertainty not knowing how? 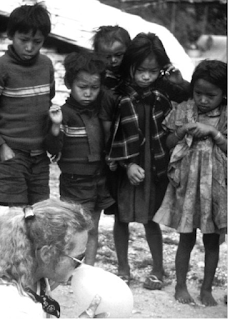 Astoundingly, I recall trekking in Nepal in 1991, like it was yesterday. The vivid memory comes after crossing the Modi Kola River on a dangerous risky suspension bridge. The rickety, rotting track was precariously missing planks. 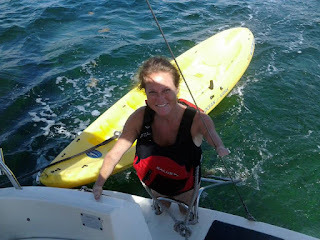 As I am very short, without legs, the grab lines were beyond my reach walking on my stumps. It was an 840-foot drop to the river below and there was enough of a wind blowing that was swinging the bridge. My heart was frantically pounding. The last thing I felt like doing after surviving this scary bridge was to take a rest so I went ahead of the group. This book empowers you to take action so that you can reach your maximum potential. Change your reality to ‘You can, anytime!’ and ‘It’s about time’ to live your passion and conquer YOUR impossible. ‘Sift through your challenges and come out on top’… turning an ordinary day into a remarkable landmark way! Sign up for a FREE download when it is ready by clicking here! Tracy Schmitt BRLS, BEd, MBA is an international keynote speaker and trainer focusing on motivational techniques. Born in Canada, Tracy has climbed mountains in Nepal, captained 110-foot-tall ships in the Eastern Atlantic, won the bronze medal in alpine skiing, and was twice nominated for the Ontario Premier's Award for her humanitarian work – Tracy's philanthropic work is too numerous to list, but to highlight a few: Tracy has been a Humanitarian International Teacher in Uganda, Jamaica, and Mexico and has volunteered for charities in Nepal and Ontario, including being an Ambassador for Rick Hanson 's I Can Days in schools across Ontario. 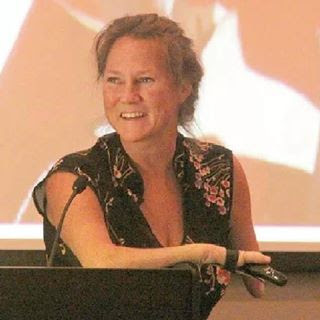 Tracy was our Proud model in The Raw Beauty Project, was Thrive magazine's 2016 cover girl, was this year's season premier guest on Rogers TV, "A Voice for All", and last month Tracy presented at the Women in Leadership and Business Conference...oh, by the way, Tracy was born a 4-way amputee! Tracy in Nepal blowing up balloons! 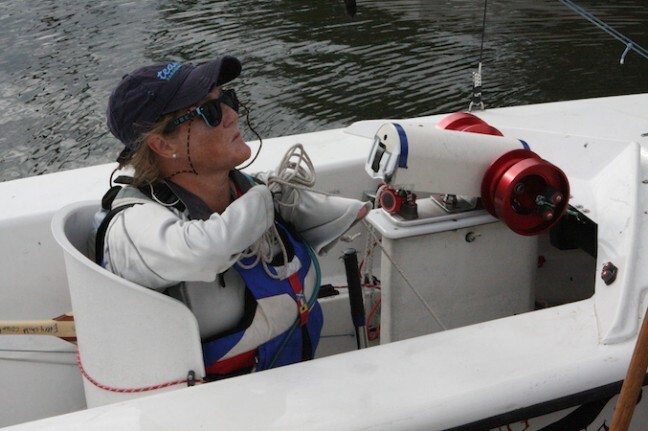 You may have seen Tracy on CBC, in the Globe, heard on the radio or online for her controversial role advocating accessible transportation and UBER Assist or for her Quest for Gold pursuits where Tracy competed internationally in Paralympic Sailing trials for a chance to represent Canada at the 2016 Paralympic Games in Rio, Brazil! As a dynamic individual Tracy's other work experiences include Corporate Learning and Development Consultant with Air Canada and Shoppers Drug Mart, and most recently the Manager of Planning and Integration for the largest most successful Pan Am and Parapan Am Games ever in Toronto 2015. Tracy's work at Shoppers Drug Mart won the company the 1) Canadian Society of Training and Development WOW Award, 2) Brandon Hall Gold Award – Best Use of Virtual Environments and 3) Retail Council of Canada – Talent Development Award". As you can see, Tracy is UNSTOPPABLE. Now Tracy wants to add author to her long list of amazing accomplishments. Her book is titled, "Unstoppable YOU" No Arms? No Legs? No Problem! Journey with Tracy to exceed uncertainties, effect change and earn respect LIMITLESS.